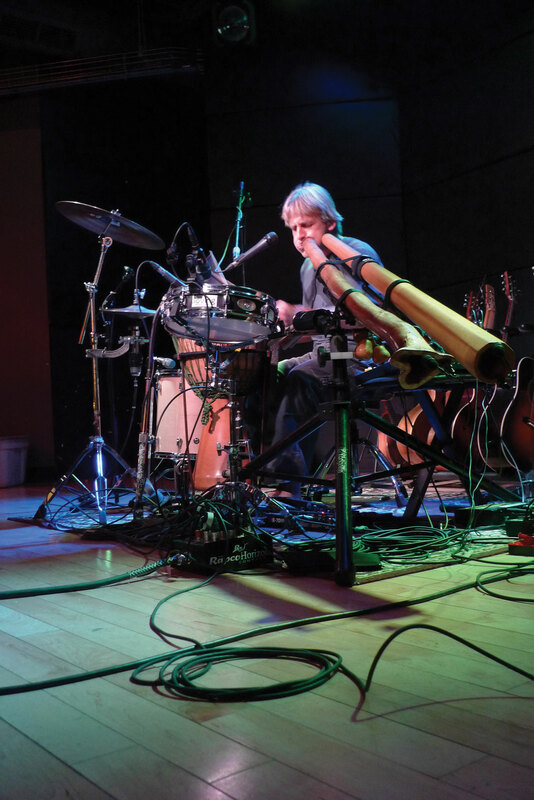 At his Jan. 22 show at The Hub, one-man-band Shane Philip certainly didn’t fail to impress students, faculty, and visitors alike. Masterfully playing the guitar, didgeridoo, djembe and various other drums and percussive instruments — often at the same time — Philip produced a unique meld of tones that resounded with the force of life. With a set featuring both rapid, lively songs and slow, relaxed pieces, his performance provided something for everyone. His fast-paced musical creations, mostly improvised on the spot, roused audience members from their seats to dance. At times, his music had people completely filling the dance floor, and drawing huge cheers from the crowd. Often backed by his slide guitar or ukulele, and accented by a self-made didgeridoo, his slower songs resonated with serenity and provided a beautiful contrast to his more energetic tunes. A master lyricist, Philip’s songs are of nature, both personal and social change, and hope for a better future. “Work and Play” reminded us to take a break and make time for fun in our busy, over-scheduled lives, while working together to “change this Earth. “It’s our link to Mother Nature — that’s the link to our soul,” he sung in “Connections”. Songs like “Island Soul” encouraged listeners to “hang up” their “hang-ups.” “Outside the Box” praised small businesses and urged people to support locally owned-and-operated stores. “It’s my protest against big corporate giants bringing the little guy under,” Philip said. Playing for over two hours, Philip drew from all four of his albums and previewed some tracks from an upcoming release. He also treated the audience to two Bob Marley covers, “Exodus” and the crowd-pleasing sing-along “Three Little Birds”. Philip will be touring with The Wailers, Bob Marley’s original band, in March. His performance at The Hub was very well received, drawing a good crowd and favorable reviews from Hub staff and patrons. The show was hosted by Mount Royal’s Psychology Student Society and Chess Club, and helped to raise funds for disaster relief in the Philippines. November’s devastating Typhoon Haiyan has displaced nearly four million people and destroyed over one million homes. By the end of the night, the benefit show had raised over $350. Events like these bring people together for a good cause, where they can enjoy top-notch entertainment and make a difference at the same time. For more information on Philip, his music and future tour dates, visit www.shanephilip.com. You can also hear his music on his YouTube page: www.youtube.com/shanephilipmusic.